The Air2G2 324 is an easy to operate, self-propelled machine proudly made in the USA. The Air2G2 324 uses three probes to laterally inject pressurized air up to 12 inches beneath the surface of the soil to fracture the compacted layers that form as a result of foot traffic, mechanical traffic and nature’s daily wear and tear. These laterally injected air blasts loosen up compacted soil immediately, but without any disruption to the surface of the turf or to the roots below. With frequent use, the Air2G2 324 creates surfaces that are healthy, firm and ready for play immediately after treatment. 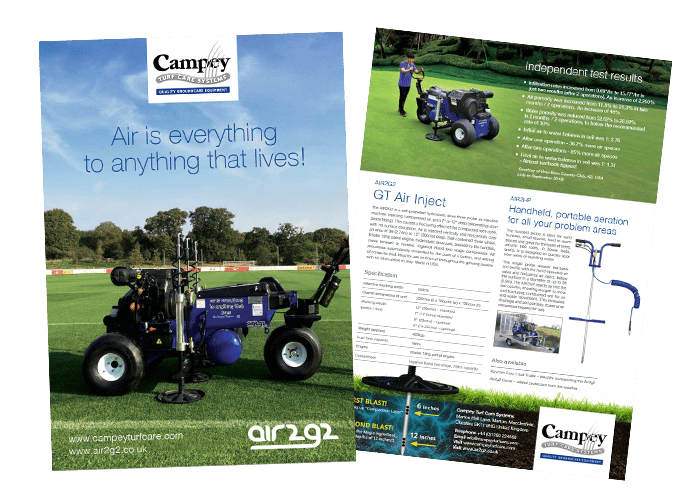 Air is everything to anything that lives, and for your soil, the Air2G2 324 is a breath of fresh air. • No post-application cleanup necessary!